DavidNews HYIP blog - News & Reviews: Nano67 - Something similar? Today, after 15 days of monitoring I would like to share my thoughts about Nano67 what since early start is together with also with us. Nano67 for me seems very simple to one mighty HYIP from past NanoIndustryInv, but it is possible that it is just a visual similarity because I do not have any facts that would prove any connections between both projects. In any case I’m happy that some project can bring up some good memories from some great HYIPs of the past. -Introduce yourself, your team, briefly inform about your experience in HYIP industry. This is Christoph Schneider from Germany. I am a trader in Forex market since year 2002, and I am in charge of the trading department of Nano67. Thomas is my partner who has many years online operation experience, and he is responsible for the site management and marketing. -What makes your project investment plans more unique than another project that you can meet out there? How safe is a script that your project use and how safe is the server that your project is using? I can not say Nano67 is unique. But definitely Nano67 is a well planned project and takes us a lot of time to plan, study, simulate for the win-win between project owners and investors. Personally I think the project success lies in secure online environment and real trading profit. To create a secure online environment, we use industry high standard DDOS protection host and extended validation SSL from Comodo to secure our site. As for members accounts security, you may notice that username is randomized, email is set not able to change and we do not disclose the payment information. To be simple, all investors information is well protected. For the trading profitability, we have professional traders from worldwide, like in USA, Germany, Japan, China, UK. We integrate the first hand policy news among the different countries and outline the preliminary trading strategy. Then the trading order will be analyzed in the Mathematical model to audit the correct ratio. If the correct ratio is over 70%, it will be put into real trading. I am quite confident that with this combination of our trading team and operation team, Nano67 will be an outstanding project! -Does the project have any hidden fees? Maybe project has some special rules for withdrawal or deposit withdrawal? We do not have any hidden fees. The mini withdrawal is $1. You can withdraw your balance at any time, and expect it will be processed manually within 48 business hours. Maybe some members will doubt why not make the instant withdrawal? We can enable it, but too much online experience tells us it is not safe. -What is your advertising strategy? Do you work with promotion on social media like Facebook to attract investors outside of the regular HYIP investor cycle? How you see your project in the future? The best advertising strategy is our members¡¯ online appraisal of Nano67. It needs time to prove and obtain. So we will first advertise in famous blogs and monitors in the HYIP industry. Then we will gradually put more advertising in paid to click network, revenue sharing network and social network. This will be done step by step, we can not expect Nano67 be famous over night. Nano67 is expected to be hot in year 2016! At that time, members will feel the real financial benefit from Nano67. It will be the best advertising for us then. In interview Nano67 administrator has talked quite honestly, despite the fast that I’m sure the administration is not doing any real trading. I liked that administrator says that this project could be win-win solution where will gain both investors and administrator himself. I hope that this will be the case here, but as we all know the basic rules in this game than this win-win situation, most likely will sponsored by last investors what will help early investors to make profit from this project. When that will happen and who will be the win-win guys I can’t say because project potentially could last for a long period of time if this project have some connection with previously mentioned Nano project. Interesting that additionally administrator in the interview is talking about Revenue Sharing projects where he will advertise Nano67 in near future. It is important to point out that these days more and more administrators start to advertise their projects on RevShare programs just because they tend to bring in some new investors. If you would like to find out what is RevShare you can read review about one of them called AdBrook over here, but now it is time to get back to Nano67. As I mentioned in the early start design for this project seems familiar and but of course it is made from scratch and it is looking well. 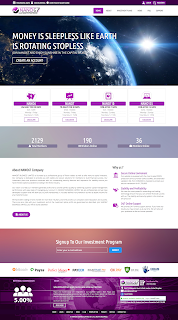 Additionally, another great thing about this project is so called “included investment plans” what are getting more and more popular because investors trust them more, more detailed information about them please check below. There are four investment plan options in Nano67 project. First two of them pay so called “included interest” and second ones pays one payment after some given period of time. Minimal investment amount in Nano67 project is $25 and if you will invest up to $499 administration will pay you nice 6% daily return for 30 days (paid only on business days) what will make 132% total return. From the total return if will you subtract your initial deposit within these 30 days you will make 32% pure profit. If you are ready to risk with the bigger investment amount than for investments starting from $500 administration will pay 7% daily, what will make 54% pure profit within these 30 days for you (also here profit is paid only on business days). 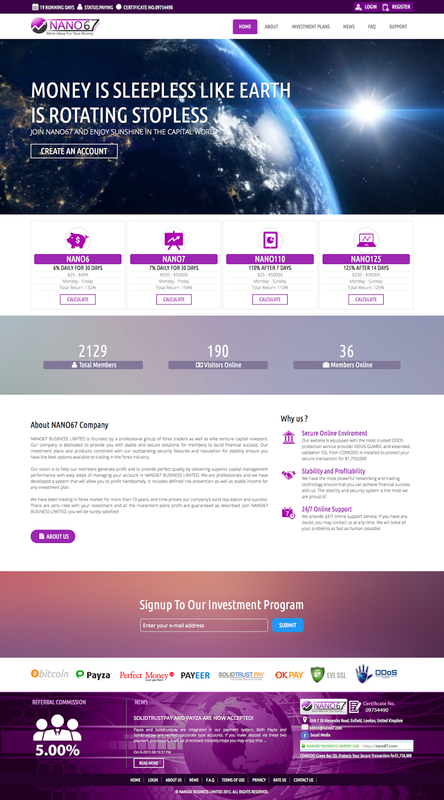 Second investment plan option offers you to receive either 110% after 7 days (minimal deposit $25), either 125% after 14 days (minimal deposit $250). Personally, I’m not a big fan of such investment plans, but if you like such investment plans you can invest, but take in mind that they are more risky than other investment plans. One thing where this project clearly stands out is the amount of payment processors that it accepts. In this project you will be able to invest with Perfect Money, Payeer, Bitcoin, Payza, OK Pay and Solid Trust Pay. Clearly not every project accepts this much payment options and that is one more reason why Nano67 is that the best choice for investments. Withdrawals in this project are paid manually, but I have noticed that the administrator does not hesitate much and processes payments very quickly. Technically project is crafted well and as you will notice by yourself project is based on a licensed GoldCoders HYIP script what is the best commercial HYIP script in the industry. From server side everything is done the right way as well because projects have server and DDoS protection from DDoS Guard what is a market leader in protective field. Additionally, I would like to mention that domain name is prepaid for five years and on top of everything comes “Green Bar” extended validation encryption. In the end, I would like tot to say that Nano67 is a very attractive project and it offers investment plans that investors like and that is why I think that project still can grow. Of course, how long it will last no one can’t know, so invest only that you can afford to lose. Come and see how 1,000's of individuals like YOU are making a LIVING from home and are fulfilling their dreams TODAY. If you're looking for the ultimate Bitcoin exchange company, then you should know CoinMama. Claim free satoshis over at Easy Bitcoin Faucet. Up to 33 satoshis every 10 minutes. ForexTrendy is a state of the art software capable of determining the most profitable continuation chart patterns. It scans through all the forex pairs, on all time frames and analyzes every prospective breakout.